The Honourable Claude Carignan, Senator, representing the Honourable Gary Goodyear, Minister of State (Science and Technology), and the Honourable Michelle Courchesne, Quebec Minister of Education, Recreation and Sports, today announced a total of $25,426,000 in investment at HEC Montréal, under the Knowledge Infrastructure Program. This major investment will go toward updating classrooms and student work rooms. Plans include converting some twenty classrooms and creating student work rooms, an amphitheatre and a specialized room for preparing students for national and international business competitions – a first in Quebec. There will also be extensive technological improvements: ACL monitors, mobile lecterns for professors, interactive blackboards and graphics tablets will all be integrated. Both faculty and students will benefit from this advanced teaching environment. The Knowledge Infrastructure Program is a two-year, $2-billion economic stimulus measure to support infrastructure enhancement at Canadian post-secondary institutions. The agreement signed by the Government of Canada and the Government of Quebec under this program will go toward various projects at Quebec post-secondary institutions, consisting of new construction and maintenance work, renovations, repairs and upkeep. For more information on the Knowledge Infrastructure Program, see www.ic.gc.ca/knowledge-infrastructure. For information on progress under the Plan québécois des infrastructures, see www.infrastructures.gouv.qc.ca. 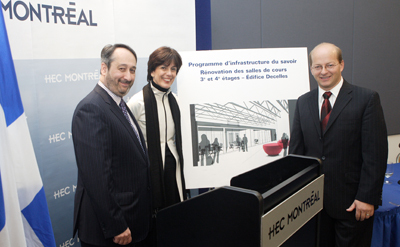 From left to right : Michel Patry, Director, HEC Montreal, Michelle Courchesne, Quebec Minister of Education, Recreation and Sports and Senator Claude Carignan.